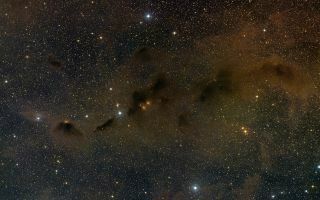 This wide field image shows extensive dust and small clumps of star formation in part of the Taurus star formation region. This space wallpaper shows extensive dust and small clumps of star formation in part of the Taurus star formation region.A faint star at the centre of this picture is the young binary star system HK Tauri. ALMA observations of this system have provided the clearest picture ever of protoplanetary discs in a double star.